Alice Cappa is an experienced creator and educator working with private and public schools, special needs organizations, and personal studio arts, including fiber arts, photography, bookarts, and writing. 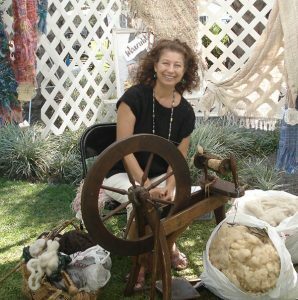 As a fiber artist and writer, she enjoys mixing fibers, media and words, such as combining book-making with stories. And creating characters to process weaving, spinning, dyeing, or paper-making. With weaving, her natural fiber wearables include a variety of styles. Color and texture are most important, including lots of nubbies, gradient colors, and some lace imagery, too. With writing, she creates stories to express these same concepts, full of color and texture and ambiance. With a background in art education and graphic design, Alice presents in schools, exhibits at shows, and tutors writing skills. Demos take her to classes and festivals, sometimes with a lamb in tow. Two ongoing series have been developing since the ’80’s. In one, to interest young people in the fiberarts, YarnTalk is an illustrated story “by my lambs”, dramatizing the process from the sheep’s point of view. On her small “farmette”, four Shetland sheep provide wool and an inspiring muse for spinning yarns, both fibrous and verbal. In the other, Tales From The Summer Hills, an enchanted land is expressed in folktales for adults. Narratives are inspired by hand-marblings, where swirls of colors and shapes come alive and speak of characters and scenes. They are magical. A quote by Samuel Johnson has long inspired: “Babies do not want to hear about babies; they like to be told of giants and castles, and of somewhat which can stretch and stimulate their little minds.” Alice creates and writes to express, to inspire, to celebrate, and hopefully her work will strike a chord within one’s own imaginative and personal themes. A few of the Summer Hills tales have been printed onto long scrolls of handmade papers and exhibited in galleries. One was chosen by WFSU’s former Stories In The Air. Another has won a 1st prize, short story, in the Seven Hills Review. YarnTalk’s story of SnoBelle, a lamb’s quest for a handwoven shawl, is being processed into an illustrated chapter book.